Mitigating against falls from height figures in many industrial contexts, and training excellence is pivotal to this, as Keith Dudhnath explains. Preparedness for potential accidents, a thorough understanding of hazards and appropriate training are central to achieving workplace safety. Where it comes to working at height, a fall of just a short distance can prove fatal, or leave a worker with permanent disabilities. It’s why the practise of developing a risk assessment is so important. Anticipating the risks and putting plans in place to combat them is consistent with widespread legislation, which exists to keep your workforce safe and well in their working lives. If you can’t eliminate the hazard from the required task entirely, be sure you have a plan for safe working. Part of a thorough risk assessment is, of course, anticipating the worst case scenario and it’s in just such situations that emergency procedures should be in place. The Work at Height Regulations require employers to plan for emergencies and rescue. The best rescue is one that doesn’t have to be performed, and so the hierarchy of rescue begins with awareness of safe operating procedures. All workers must be trained by suitably qualified instructors to operate safely at height. Self-rescue is the next step on the hierarchy of rescue. With appropriate training and equipment, workers will be able to get themselves out of trouble in the unlikely event of a minor incident occurring. A broader awareness of rescue procedures goes hand in hand with self-rescue. A conditional rescue is one in which the victim is able to play a part to aid rescuers. The flip side of this is a true rescue, where the victim can’t aid rescuers. By their very nature, true rescues are more complicated and can be more time consuming. Clearly, an informed and trained victim will reduce risk and impact if a rescue is needed. Following on from self-rescue is co-worker rescue. At a minimum, everyone working at height must be able to keep themselves safe, their co-workers safe, and be able to perform basic co-worker rescue. Time can be a critical factor in rescues, so it’s ideal to have a trained rescuer already on the scene and with the necessary PPE and equipment already in place. Knowing that employees can rescue a co-worker before a situation escalates is a vital part of an employer’s plan for emergencies and rescue. An employer’s plan for rescue must begin with a risk assessment, as mentioned previously. This must take into account the obvious factors such as nature of the work being undertaken, location of that work, environmental hazards and the skill and training levels of those undertaking the work, as well as any access issues for additional rescue teams. This risk assessment will then lead on to the pre-plan for emergencies and rescue, ensuring that everyone is suitably trained, and knows how to operate if an incident occurs. The scope of the rescue plan is directly informed by the risk assessment. At the lowest level of requirements, safe working at height training and co-worker rescue at height training may suffice, but employers with wider requirements, in terms of worker numbers, nature of the work/facility or perhaps access/egress issues, may need to provide a stand-by rescue team. This could be staff trained to provide such rope rescue, or buying in a contracted rescue service. While the statutory emergency services will probably become involved in a major incident, it is not sufficient under the regulations to rely on them to provide your rescue capability. A rope rescue team can wholly comprise of rope rescue technicians, or a number of rope rescue technicians supervising rope rescue operators. Rope rescue operator training will imbue employees with a great deal of knowledge for working safely at height and undertaking rescues. Those employees who require technician-level training will begin with operator-level training. Beyond this, advanced technician-level training is also available for employers with more specific requirements. A suitably trained and qualified rope rescue team can form an important part of any employer’s rescue plan. As with everything relating to health and safety, employers should hope for the best, but plan for the worst. Having employees suitably trained as a rope rescue team, prior to any involvement by the emergency services, can ensure a swift, safe and successful response to any incident. Employers can follow a number of training pathways. The first of these is to have employees trained wholly in house. Regulation 5 of the Work at Height Regulations (2005) states that you must ensure that everyone involved in the work is competent (or, if being trained, is supervised by a competent person). This includes involvement in organisation, planning, supervision, and the supply and maintenance of equipment. While employees may be able to pass on knowledge of day to day operations to co-workers, there is a large leap from this to meeting the competency requirements for training for emergencies and rescues. If following the wholly in house path, an employer would have to invest heavily in an employee or employees who were developing, in isolation, an in house training scheme that could meet the legal requirements. These employees would have to constantly keep abreast of all the latest developments in the field and current best practise, as well as documenting the evidence of this experience, to satisfy any and all questions that may be asked of them in the worst case scenario of an incident occurring. A simpler and more cost effective training pathway is for employers to seek an external training provider, suitably accredited to deliver the highest standards of safe working at height and rope rescue training. Furthermore, regulation 6(5)(b) states that where other precautions do not entirely eliminate the risk of a fall occurring, you must (as far as it is reasonably practicable to do so) train those who will be working at height how to avoid falling, and how to avoid or minimise injury to themselves should they fall. By undertaking training with a suitably accredited external training provider, an employer will meet, and enable their employees to meet, these requirements. Of course, simply outsourcing training to a third party doesn’t have suitable qualifications themselves won’t meet these requirements. It’s vital that any training is delivered by an organisation that is backed by a large accrediting body that offers international accreditation and recognition of their qualifications. Larger employers, or those with very specific operational requirements, may look at the training pathway of becoming an externally accredited training provider in their own right. For an employer with staff externally accredited to advanced rope rescue technician status, there’s only a small leap to put them through instructor training and assessment with the accrediting body. This will allow an employer to deliver in house training, using staff that they can be sure meet all the legal requirements. These staff will have the support of an international accrediting body with an ever-expanding breadth of knowledge. With qualifications valid for a set period of time, before a simple update workshop needs to be undertaken, an employer ensures that its employees are always working to current best practise. Obviously, different industrial environments will present workers with different challenges – something that is illustrated in the following case studies, in which appropriate training not only led to cost savings, but increased productivity. A wind turbine company, operating three wind turbines with external ladders on a single site employed five wind turbine operators, including a team leader. In order to meet the requirements of the Work at Height Regulations (2005), the management and the team leader actively worked on a plan for emergencies and rescue, but they found that the team leader was increasingly drawn away from his daily duties. The management considered hiring another wind turbine operator, in order to free up more of the team leader’s time, but instead sought Wind Turbine Operator training from an external training provider which offered international accreditation. The nature of this training was industry-specific and site-specific, but broadly covered safe working at height and co-worker rescue at height training. Qualifications gained on this course are valid for a period of three years, after which recertification is required. The training was a mix of classroom-based and practical. Of particular use to the team leader in this instance were the lectures on UK regulations and legislation, risk assessment, pre-planning, developing rescue plans, incident size-up and incident management. These lectures can be bespoke/developed specifically for a particular company and its operational area. In this way the team leader was empowered to fully develop a relevant plan for emergencies and rescue after the training – made significantly easier to communicate to co-workers largely due to the increased knowledge of the operators. The practical sessions included training for different types of fall arrest equipment, use of lanyards and shock absorbers, emergency descending, and the rescue of a co-worker from fall arrest systems. 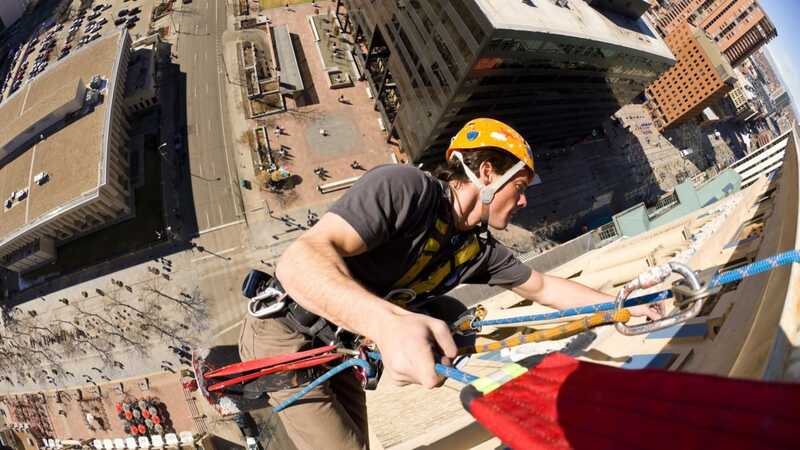 Participants said they experienced an increase in their ability to work safely at height, as well as to rescue co-workers in the event of an incident occurring, which impacted positively on workplace morale. A port authority responsible for more than half a million TEUs (shipping containers) per annum employs more than 500 workers throughout the authority. Work at height and using cranes takes place continuously over a large operational area. The authority identified that there were a higher than expected number of working days lost per annum as a result of incidents at height and sought a solution to the concurrent goals of increasing worker safety while minimising the financial losses associated with lost working days. Analysis of operating procedures indicated that there was scope for improvement within emergency and rescue plans and the authority decided on a two stage process for meeting its goals. The first stage was for the training of a dedicated rope rescue team. This was through an external training provider to the level of Rope Rescue Technician. For operational reasons, the rope rescue team comprised members of their on-site advanced first aid team, allowing a fully coordinated response to any incidents, and the speediest delivery of stabilisation of any patients. The training mixed classroom-based and practical sessions, with lectures including topics such as relevant legislation, size-up, pre-planning, ICS (incident command system), on-scene safety briefings, site control, medical considerations, equipment care and maintenance, and system safety checks. Practical sessions developed from the elements of safe working at height and co-worker rescue at height training. They looked at team-based solutions that are required when co-worker rescue solutions are not sufficient. In addition to team-based raising and lowering techniques, the rope rescue technicians were trained in a number of personal skills vital for their work, including key skills such as passing knots, anchors and deviations when ascending/descending, as well as rope transfers and changeovers. The practical sessions also covered casualty access and care elements. The second stage of this organisation’s action plan will involve training key staff to rope rescue instructor status, so that in the longer term they can become an externally accredited training provider in their own right. This will enable them to train their rope rescue team in house, to the highest standards, while ensuring their instructors remain current with industry best practise. These instructors will also be able to train the wider body of employees to work safely at height. The impact on reducing lost working days and improving worker safety has already been seen. Because the training is internationally accredited, it has also benefitted the authority when recruiting new employees – many of them already hold this qualification, and thus are operationally up to speed much more swiftly than those who don’t yet hold it.